The X-DREAM incorporates a patented adjustment system which allows you to optimize the angle of the handle for steep and sustained ice routes or delicate mixed pitches - effectively giving you two-tools-in-one. Radical 3D handle is molded around a solid aluminum core and bolted to shaft providing a sturdy carabiner clip-in point - for leash attachment, copping a rest or backing up anchors. The underside of both "rests" sport serrated teeth for additional purchase and stability and the bottom rest has integrated rubber pad - to save your pinkies. For dry tooling and mixed pitches, position the handle "up" (as shown)- so the pull is more down and out - locking you onto thin edges. For ice and a more natural arcing swing - drop the handle down - 15 degrees - so it's more parallel to the lower shaft. Climbers of all ability can further fine tune the X-DREAM for hand size or preference with the micro-adjustable trigger finger ledge (choose from two length inserts that can be flipped over to adjust their height) and a bolt on third tier POMMEL (included). Factory equipped with the MIXTE PICK which has a more aggressive downward curve. 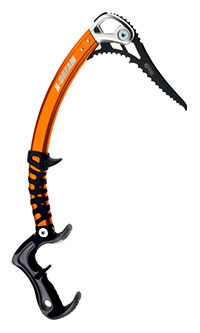 Accessory ICE PICK is "flatter" and smoothes out the swing for straight forward, steep & sustained Grade VI ice. Both 50 cm shaft and picks are T Rated and incorporate refined beak and tooth configuration, lightening cut-outs and large clip-in window. Made in Italy, 3 year guarantee, shipped everywhere.